The members of the General Committee are listed below. 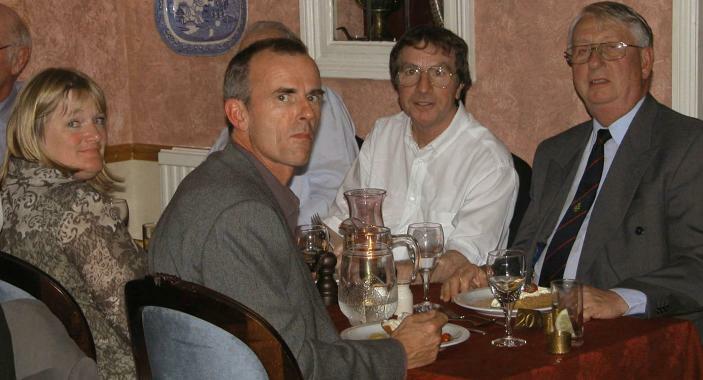 Archiving sub-committee: Roger Garrard (Chair), Michael Brand, David Spinks. Communications sub-committee: Mike Herring (Chair), Carole Arnold. Fundraising sub-committee: Phil Robinson (Chair), Steve Read. WCR sub-committee: Carole Arnold, David Spinks. Old Wymondhamians will not be expected to pay annual subscriptions, however donations may be made at any time! Please consider joining the 100 Club and make use of the Affiliate Links on this web site when buying CDs, books, videos, toys and electronic items on-line - it won't cost you a penny more than direct access to the shops concerned. Please read the WCA Constitution (PDF file). You may be aware that Melvyn Roffe, Wymondham College Principal for the past 7 years, is leaving this summer for pastures new as Principal of the George Watson’s College in Edinburgh. 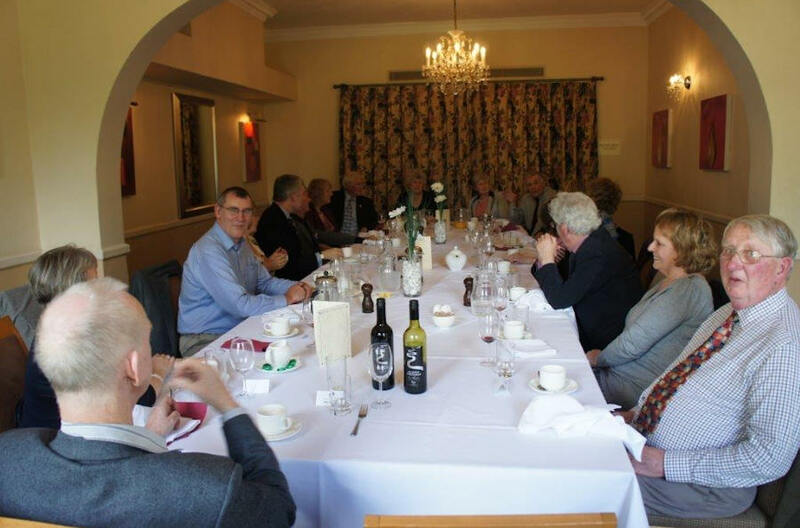 As a thank you to Melvyn for all the support and encouragement that the Old Wymondhamians have received during his tenure, he was invited to a farewell lunch after the latest Committee Meeting. 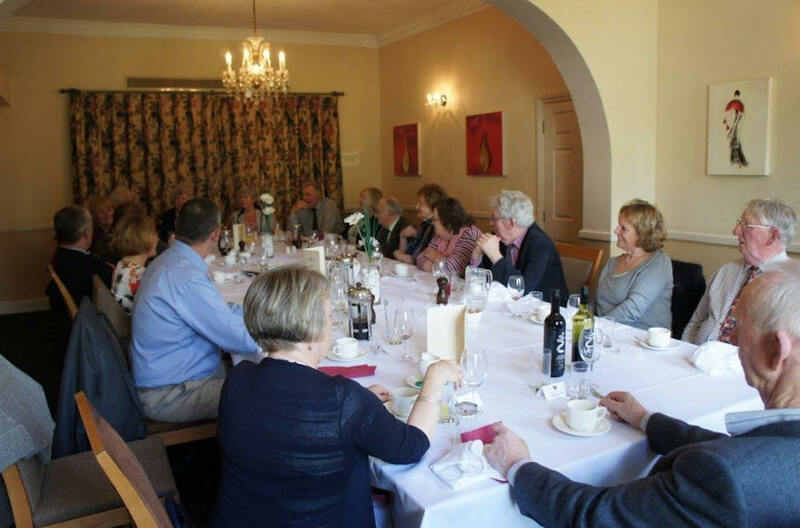 This was held at Park Farm Hotel in Hethersett on Saturday 10th May 2014 and attended by 19 committee members, friends of the OW’s and wives and partners. 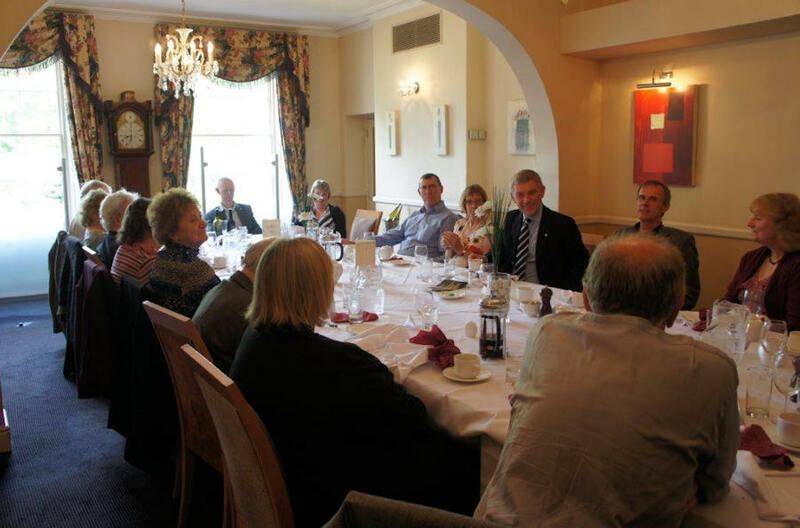 A thoroughly enjoyable meal was accompanied by brief speeches by David Spinks, Mike Herring & Melvyn. 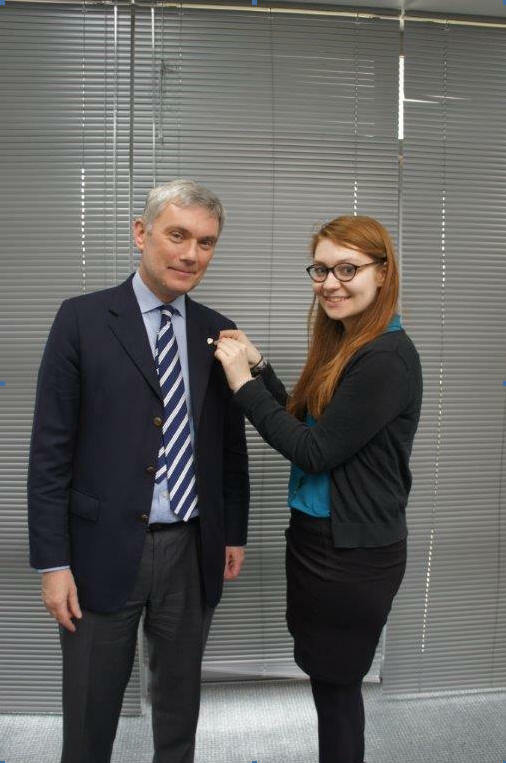 Melvyn officially becomes an OW with the issue of the new OW lapel badge, presented by Rachel Campbell Still, winner of the OW Travel Award 2014. For 16 years and intermittently before this we strived to create ways of bringing you the news of the activities of the College and of Old Wymondhamians (OW) across the Globe. We have done this through our annual Newsletter posted in the UK, on Wymondham College Remembered and e-mailed to our global friends. Most of our funds arise through the efforts of Steve and Phil in voluntarily running the 100 Club which covers the £2810 needed to publish and post the 2012 Newsletter. The content however depended on the alumni secretary collating all the news from letters received and information posted on the Wymondham College Remembered website. The response from former students indicated to us that this publication was much appreciated. We need to explain why this year’s Newsletter will be somewhat abbreviated and not reach you as a usual posting. The huge effort of the College and volunteers in bringing to fruition the most successful and happy celebrations of the sixtieth anniversary unfortunately coincided with the dramatic financial and political upheaval in just about every facet of the nation’s affairs. In consequence the College has had to review its administrative expenditure resulting in a 90% reduction in staff time allocated to the affairs of the OW’s and hence therefore no one available to write the usual content. All is not lost however as Principal Melvyn Roffe and the OW committee will be seeking other ways of keeping you informed which will include an improvement in the College owned student data base and continued development of the OW owned Wymondham College Remembered Website. Many former students express their appreciation of their time at Wymondham even those whose experience on occasions was less than joyful. 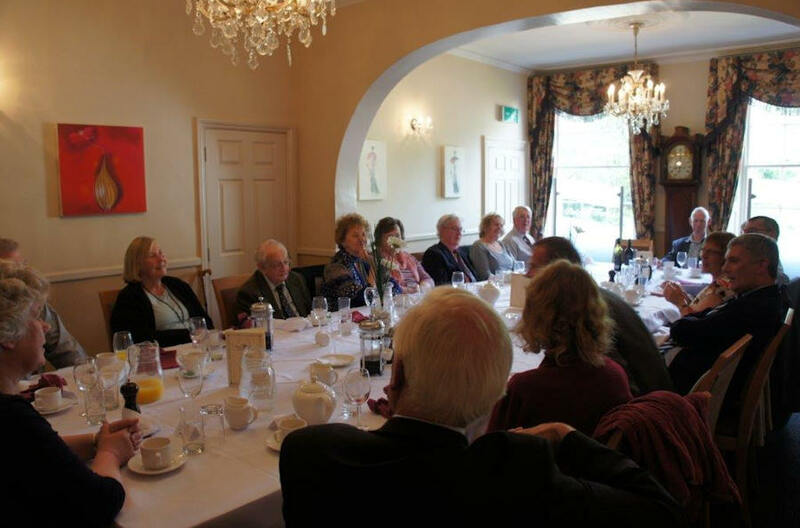 Some have sought to express their support through becoming Governors, Trustees, Parents of current students and some even as OW committee members attending just three meetings a year and enjoying the experience Wymondham offers its friends. If you are interested in the future of Wymondham College, education in general and maintaining your bond of friendship within the former student/staff fraternity then please consider supporting or attending our meetings where the aim is to offer a little help and enjoying the occasion. Former students or staff of any era are welcome and at this time particularly those of the 70’s and 80's. Please contact Julie if you would like to help in any way. 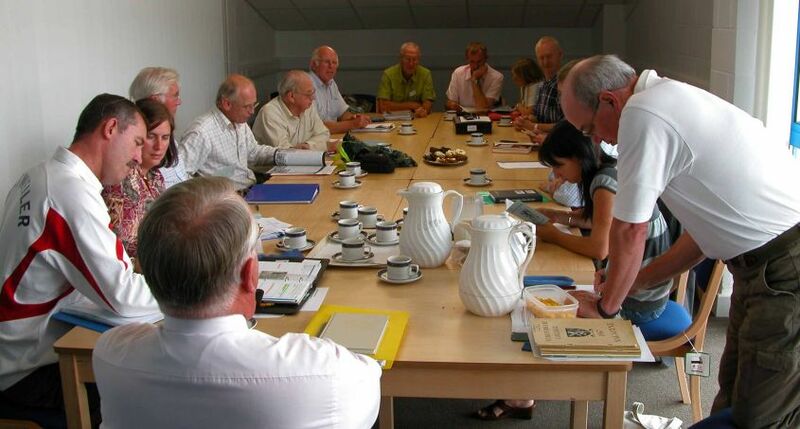 At the Old Wymondhamians' Committee meeting held in May 2009, Bill's very generous offer to pass this web site to the ownership of the Old Wymondhamians was formally accepted. 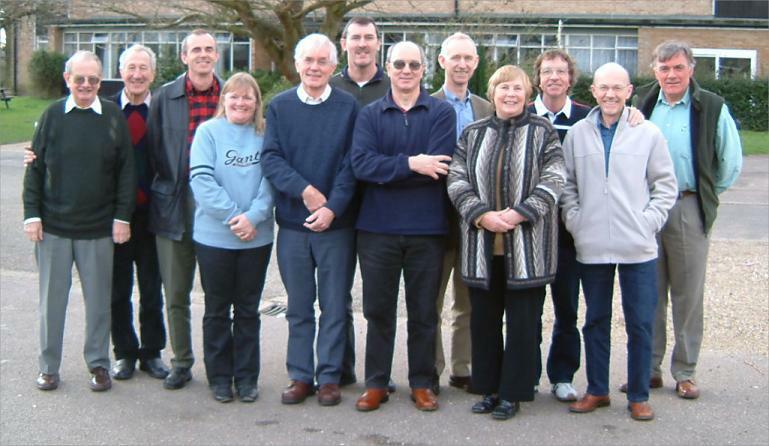 The Committee have expressed their thanks to Bill for all the hard work that he has put into building the web site and will continue to update and develop the site on behalf of all those who have attended Wymondham College over the years. The 2006/2007 WCA Chairman, Mike Brand, with the College's new Alumni & Marketing Officer, Jackie Glenn, at the June 2007 Committee meeting. Jackie has now moved from the rather cramped accommodation in the Chapel to an office in the new admin block (an extension of the Refectory building). The old Alumni office will be retained as a permanent archive and display space for the Association. 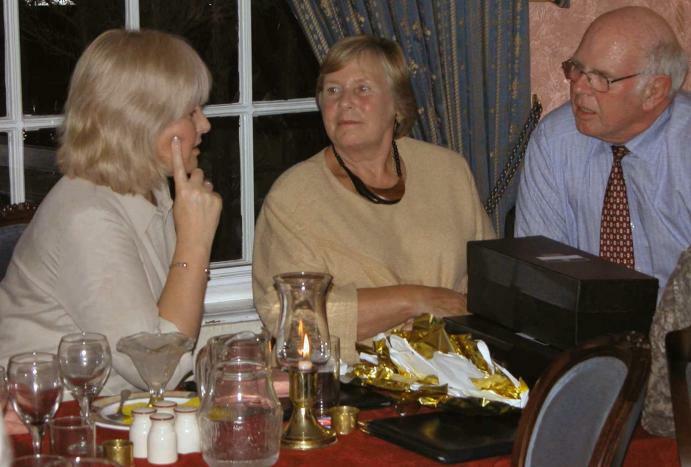 Carole Arnold retired from her position as Wymondham College Association (WCA) and Wymondham College Trust (WCT) Secretary in September 2005 (see below for photos taken at her leaving 'do'). She was replaced by Joanne Allen, who had a busy year before taking retirement in December 2006. 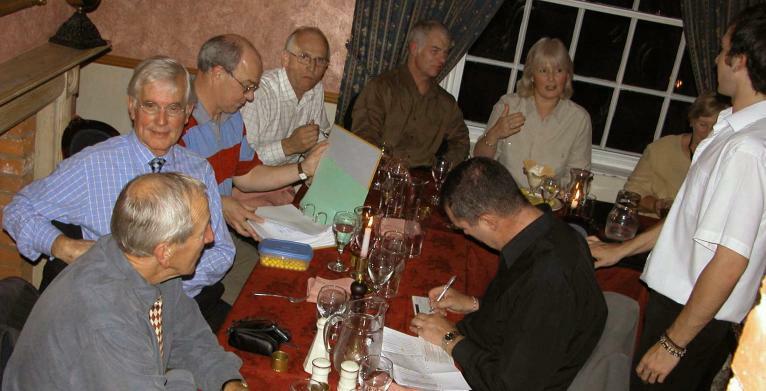 Alumni Secretary Carole Arnold was dined out by the Wymondham College Association Committee and representatives from the College on 24th September 2005 at the Bird in Hand, Wreningham. After the dinner Carole was presented with a crystal decanter and a set of glasses. 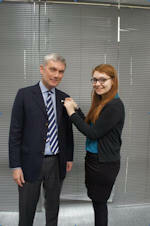 She hopes to continue her involvement with the Association. 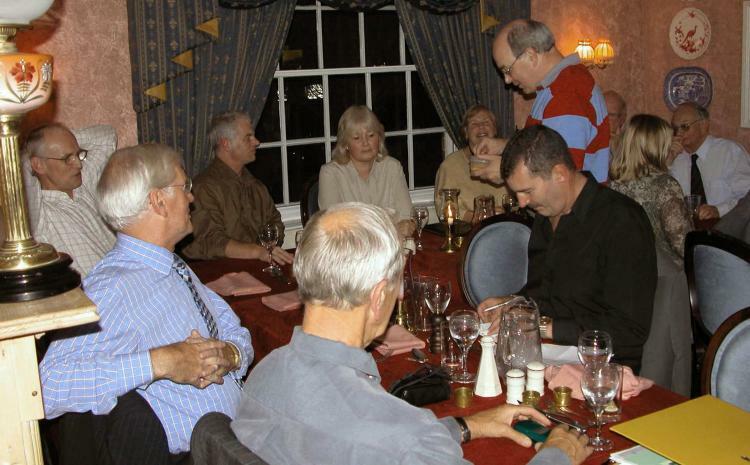 Attendees were Carole Arnold, Victoria Musgrave, Bob Rowell, Jack Smith, Asha Simmons (Ramseebaluck), Mike Chambers, Phil Robinson, David Spinks, Roger Garrard, Julie Harding (Ebbens), Philip Wade, Mike Brand, Colin Leaford, John Beales, Steve Read and Bill Atkins. The following photos were taken by David Spinks. The first general meeting of the Wymondham College Old Pupils Society was held in the Lecture Room in Wilkinson Court on Sunday 15th July 1956. As no Officers of the Society had previously been elected, Mr Ryde acted as Chairman and Mr A. Chilvers recorded the minutes to begin with. Mr Metcalfe opened the meeting by giving an address welcoming the Old Pupils at the Reunion and went on to emphasise the importance to the College of an Old Pupils' Society, its formation forming another step in the history of the College. Nominations for the election of a President were then called for by the Chairman, in reply to which Mr Harbord proposed that Mr Metcalfe be elected President, this being seconded by Mr Stearman. No further proposals were forthcoming and Mr Metcalfe was unanimously elected President. The third item on the Agenda was the election of a Chairman. Mr M. Beck proposed that the Chairman should be an Old Boy, this being seconded by Miss G. Eastwood. No amendment was made to the proposed and it was carried by a large majority. Nominations for the Chairman were then called for. Mr J. Smith proposed Mr M. Beck, this being seconded by Mr A. Howe. There were no other nominations and Mr M. Beck was unanimously elected Chairman. At this point Mr Ryde, who had been acting as Chairman, handed over the chair to Mr Beck. Mr Beck being established in his new position, the meeting moved on to the next item on the agenda. This was the election of a Secretary. Miss G. Westwood proposed that the present Secretary Mr A. Chilvers should continue in office. Due to the probability that he would no longer be resident in the county he declined to stand. Mr Ryde proposed Miss A. Bean and this was seconded by Miss Shepheard. Miss M. Brown followed by proposing Miss M. Seaton, her proposal being seconded by Miss A. Goward. A vote was taken and Miss A. Bean elected Secretary. At this point Mr Ryde proposed a vote of thanks should be recorded in the minutes to Mr A. Chilvers the retiring Secretary. This was unanimously agreed upon. The election of a Treasurer was brought forward from point six to point five on the Agenda. Miss M. Scott proposed Miss J. Daniels and this was seconded by Miss M. Hall. A further proposal came from Miss M. Brown who proposed Mr D. Diggle and this was seconded by Mr D. Spinks. Mr D. Diggle was elected Treasurer by 38 votes to 15. The election of a Committee to consist of two Old Boys and two Old Girls then followed. Nominations for a Girls' Sports Secretary were first called for. Mr A. Chilvers proposed Miss J. Daniels and this was seconded by Mr A. Howe. Mr T. Tilley proposed Miss P. Coles, being seconded by Miss M. Savage. Miss J. Daniels was elected Girls' Sports Secretary by 35 votes to 15. For the office of Girls' ordinary Committee Member Miss M. Scott proposed Miss J. Harris and this was seconded by Miss J. Daniels. Miss P. Coles previous nomination was then considered for ordinary membership of the Committee. Miss J. Harris was elected ordinary member by 35 votes to 15. Nominations for two Old Boys to the Committee were called for. Miss M. Brown proposed Mr D. Spinks as Boys' Sports Secretary and this was seconded by Mr T. Tilley. As this was unopposed Mr D. Spinks was unanimously elected Boys' Sports Secretary. Miss Shepheard proposed Mr J. Hagg as an ordinary Committee Member and this was seconded by Miss M. Brown. Mr D. Spinks proposed Mr H. Harbord and was seconded by Mr A. Chilvers. A final nomination was made by Mr J. Smith who proposed Mr A. Chilvers and was seconded by Miss G. Eastwood. Mr A. Chilvers was elected ordinary Committee Member. Several amendments followed as a result of discussing point 7 on the agenda. The final decision reached was that the members of the Staff to act as ex-officio members of the Committee should number four in all and consist of two male and two female, one of each being a senior member of Staff. Nominations were called for and Mr J. Hagg proposed Miss Shepheard which was seconded by Mr T. Tilley. Mr C. Stearman proposed Mr Ryde and was seconded by Mr A. Chilvers. Mr R. Collins proposed Mr Bailey and was seconded by Mr D. Spinks. Mr Bailey however, did not wish to stand. Miss J. Harris proposed Mr Appleyard and was seconded by Mr H. Harbord. Finally Miss G. Eastwood proposed Miss Brunning and was seconded by Miss J. Daniels. All the nominated members of staff, with the exception of Mr Bailey were elected ex-officio members of the Committee. As a result of open discussion on point 8 it was decided that the name of the Society should be left open and suggestions sent to the Secretary. Amongst the suggestions made at the meeting were "The Impressionists" by Mr T. Coppin and "Wymondham College Old Students Association" by Mr H. Harbord. The choice of a badge and tie were also left open. Points for the constitution were also left open and it was decided that that the Committee should draw up a provisional constitution which would be presented to the Society for debate. Mr J. Smith proposed that Mr Diggle should bank with Barclays Bank rather than the Tuck Shop Fund, and this was seconded by Mr Chilvers. It was unanimously agreed upon. On the point of membership it was decided from open discussion that people leaving should apply for membership to the Committee who would decide. There were several other points raised when the Chairman called any other business. Miss G. Eastwood proposed that Dr Mosby and Miss Tebbutt be elected Honorary Vice-Presidents. This was carried unanimously. 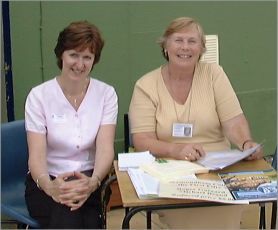 Miss Eastwood also proposed that all ex-members of of staff and present members be invited to attend Society functions. This was seconded by Mr A. Chilvers and carried unanimously. Mr J. Smith proposed that a Committee list be sent to all members and was seconded by Miss G. Eastwood and carried unanimously. Miss G. Eastwood proposed that a provisional date for the next annual general meeting be made. This was seconded by Miss M. Brown and was unopposed. Mr T. Tilley proposed the last weekend of the summer term in 1957. Mr N. Daniels seconded this and again it was unopposed. Amongst suggestions were official Society stationery and a Society magazine. With this the meeting closed.